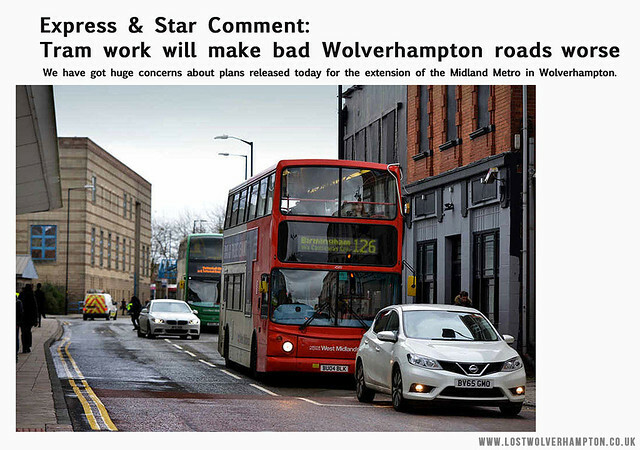 Express & Star Comment: Tram work will make bad Wolverhampton roads worse. We have got huge concerns about plans released today for the extension of the Midland Metro in Wolverhampton. The new £15 million line will run along Pipers Row and Railway Drive to link the St George’s stop with the train station. The route should set alarm bells ringing for anyone who has had the misfortune to travel around that area of the city in recent times. Now sometimes the same story can be a much older one outside our own memories. As with traffic along Pipers Row, a ancient thoroughfare, which was cut well before Isaac Taylor published his map in 1750. during which time Wolverhampton was about to play an important role in the industrial revolution; a period of technological progress in Britain and the World. But we are not though concerned today with The Coach and Mail trade, of the latter part of the 18th century and neither of the Private Horse Omnibuses, a little later. We are concerned with the Local Tram system starting in 1878, and of its changing system as it travelled along the two hundred yard street known as Pipers Row. So in the first instance. Site for Midland Metro Terminus to open May 1999. 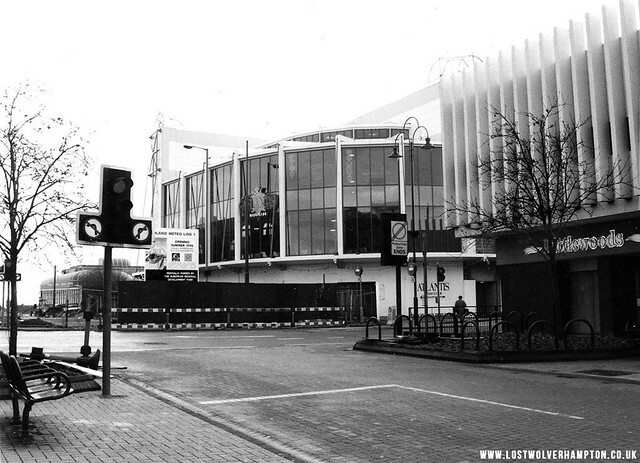 Looking across the Junction with Market Street and Garrick Street in 1998 we see the proposed Terminus opposite the Police station in Bilston Street for the eagerly awaited Midland Metro, last seen close to here seventy odd years ago. Yes we had already been down this road before. 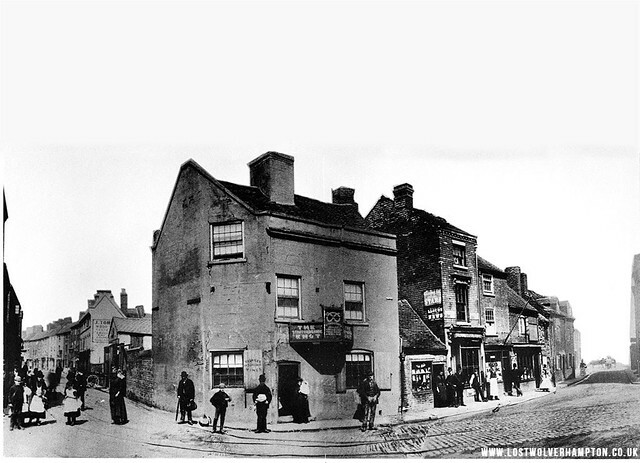 Pipers Row, Walsall Street and Bilston Street Junction circa 1900. The Staffordshire Knot stood opposite the Blue Ball on the corner of Walsall street and Pipers Row, and according to my grandfather who lived in Duke Street off Walsall Street at that time outside The Blue Ball, was the penultimate stop for the Two-horse,double-deck trams, from Bilston Town Hall to Five Ways and finally Queen Street (Notice the tram tracks continuing down Pipers Row from Bilston Street). Another place seen on this photograph mentioned by him was Tommy Eggington’s Barbers The shop in Walsall Street, with the pole outside. The Crown Court stands on the corner of Pipers Row,and Bilston Street today in 2016. 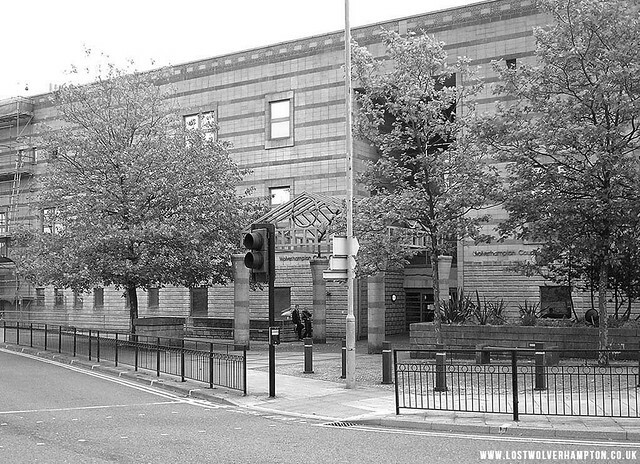 On the corner of Walsall Street and Bilston Street today on the former site of the old Staffordshire Knot is the Crown Court, and around the corner is the Underpass beneath the Wishbone Bridge that carries the existing Metro Tram Line From Snow Hill Birmingham to its Terminus opposite the Police station in Bilston Street. But the idea is now, to carry on with extra new track from the existing terminus to a new one at the Railway Station via Pipers Row. As I have remarked we have already been down this road before. The first trams to travel down Pipers Row were Horse Drawn. 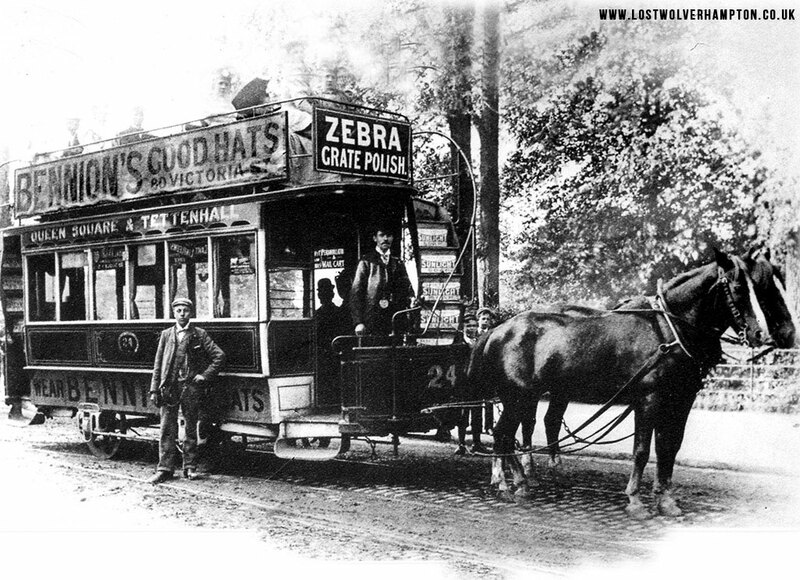 The first tramcar began to operate commercially in Wolverhampton on May Day morning in 1878. It was a one horse, single deck car and it left Queen Square at 8.00am for a journey to Newbridge. An Interesting story regarding the initial Horse-drawn tram system comes from an old chap I met in the early 1950’s whilst visiting Alf James egg packing company in Evans Street Whitmore Reans. The old fellers name I recall was Billy Turner he lived at 91 Evans-Street. Billy started as a tram conductor in 1886, he said the manager then was a Mr Stimpson. He told me; Then there was only four services across town at that time To Tettenhall (Newbridge only) from Queen Square. From Queen Street to Swan Bank Bilston. From Five Ways to Willenhall. And from Swan-Bank, Bilston to Moxley, which was a single decker car, though double deck trams imported from New York were used on most other routes. 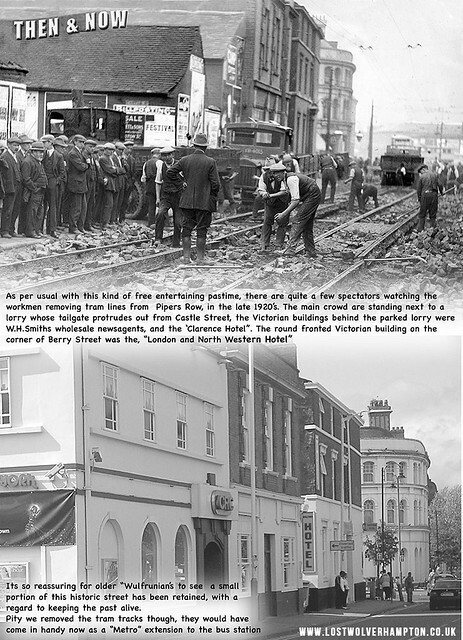 The offices in those days during the Horse-drawn era were at 45 Darlington Street (Were the underpass is today 2016), and of course Pipers Row was part of the first leg on Queen Street to Swan Bank route. 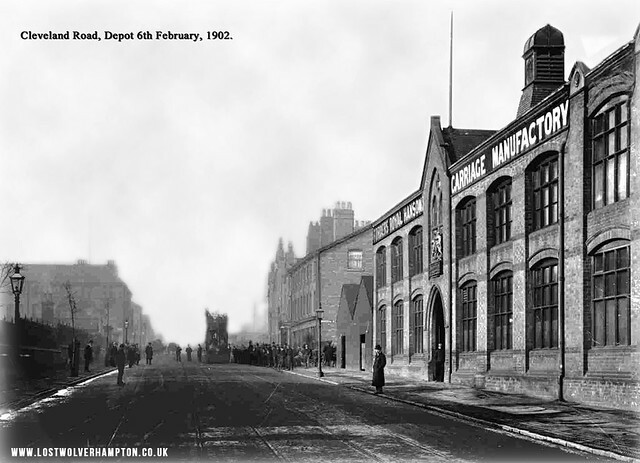 Outside the new Cleveland Road Tram Depot 6th February 1902. Wolverhampton continued with the horse until the idea of Electrification of the towns tramway system was decided upon in 1901, the American “Lorain” system was chosen but not without argument or doubt far from it, The issue split the Town Council and indeed the populace into two camps. The ‘Lorain” system used contact boxes set between the tram lines at ten feet intervals and connected to each other by cable. Late 1920’s removing the existing Lorain Tram Tracks (2) Same spot 2009. Now its ironic But I did this Then and Now scenario some six years ago and the powers to be today feel its a good Idea to replace the lines. Perhaps It could be “One Way” of looking at it I just hope they don’t decide to continue Up Queen Street, Down through Queen Square, Darlington Street, and Chapel Ash to Newbridge. As in the first place. « THE WOLVERHAMPTON INNER RING-ROAD – Is No Friend Of Mine! £15 million to get the tram lines to the station!!! Are they going via Chapel Ash or something? I Just think it could be better spent else were. I can’t see our town with its terrible traffic congestion being able to find any benefit from a tram route extension. At any cost.